Tour Day, Tour Day! | NJNA is Blogging! Mint Julep Tours took nineteen of us on a wonderful journey to some interesting Louisville sights! We started the day at the Art and Craft (NOT Arts and Crafts) Museum which is only a few blocks from our hotel. The director of the museum explained his vision to show the relationship of craft to art. There were two special exhibits and a permanent exhibit for us to view. My favorite was the special exhibit of black and white photography taken in the 1950s and 1960s — from what may have been the original paparazzi! When the photographer died, he left his collection of photographs to his sister who lives in Louisville. It was so much fun to go around and guess who all the famous people were. 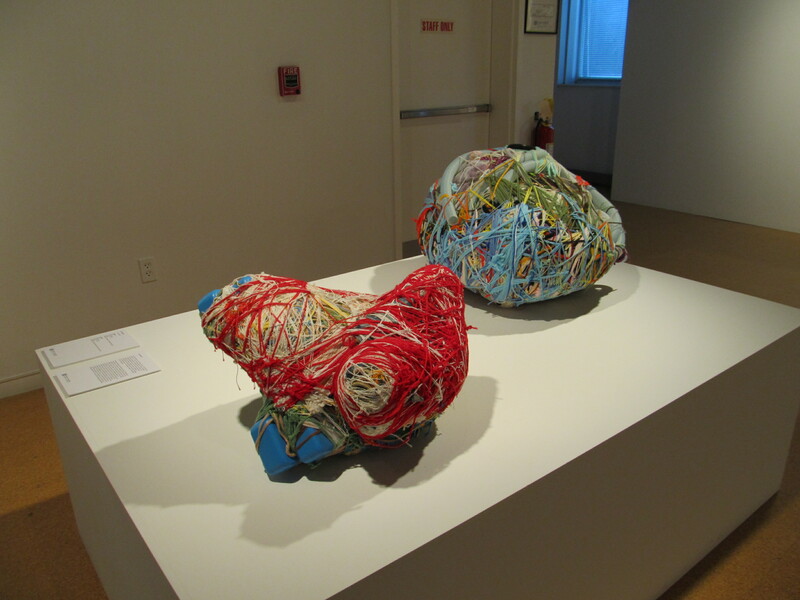 Two of Judith Scott’s yarn sculptures! Apparently her work is shown all over the world. The director stressed that the museum wanted to emphasize the art and not the artist’s disabilities. Several other artist’s works were also part of this exhibit. The permanent exhibit showed the “Best of Kentucky” crafts. 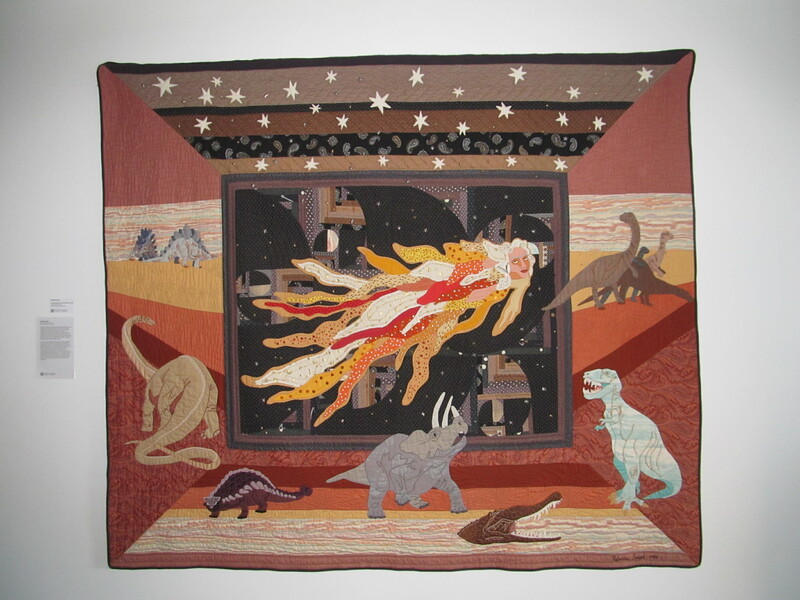 This lovely quilt depicts Haley’s Comet surrounded by dinosaurs. 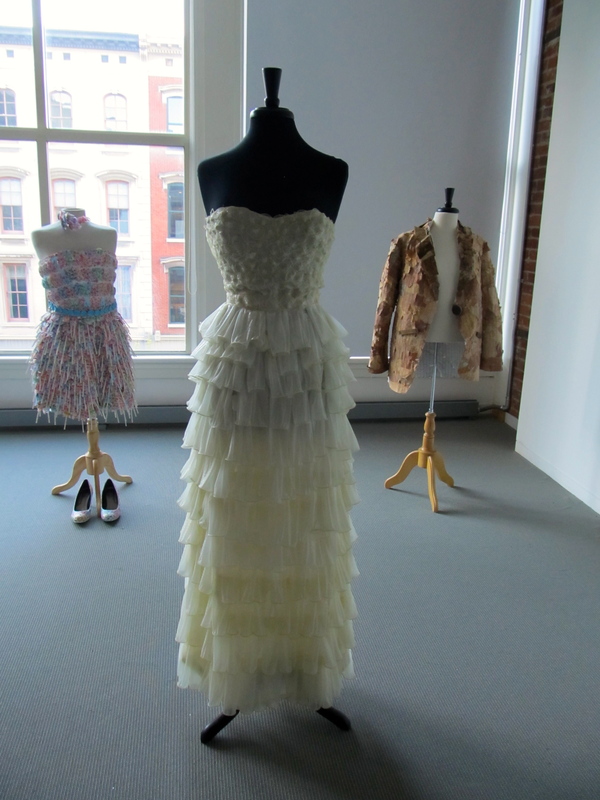 But by far the most noteworthy part of the Best of Kentucky exhibit was the trash fashion — dresses made from Sunday comics, juice bags, lollipops and …. can you guess what the one in front is made of? Answer at end of post! 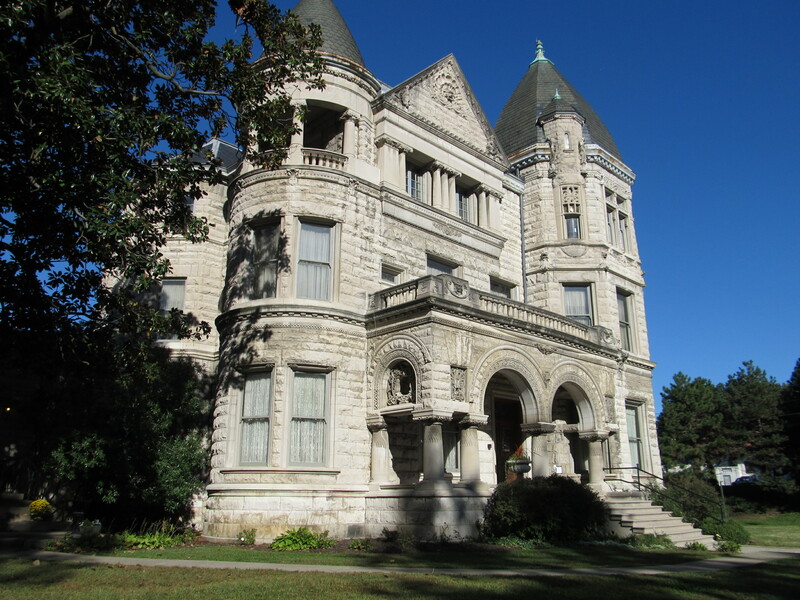 Next, we drove to the Conrad Caldwell House in a very swanky part of Louisville. A major flood on the Ohio river wiped out most of Louisville in 1937. After that, the wealthiest families rebuilt and Mr. Conrad, who had made his fortune tanning hides, was one of them. He built this stunning limestone “castle” and monument to his wealth. Unfortunately, Mr. Conrad died soon after the house was finished and his widow sold it to Mr. Caldwell who had made his fortune in constructing water tanks (after prohibition killed the bourbon vat business!). So the giant Louisville Slugger bat in Sue’s post was one of his creations. It seems that the city would not allow the bat to be erected unless it had a useful purpose. So there are water pipes all inside that giant bat! Anyway — this was one of the coolest house tours ever because the three tour guides for our group were all related to Mr. Caldwell. The house had passed out of the Caldwell’s hands and had become a rest home for Presbyterian widows. When their numbers became too large, a new facility was built and the church turned it over to the city and a non-profit organization was founded for its upkeep. So, the great-granddaughters of Mr. Caldwell run the tours and provided us will all manner of Caldwell history and anecdotes! They knew which furniture was original and which bannister their father had slid down as a kid. What a wonderful way to get to spend time in the old family homestead! We saw an old vacuum cleaner that took two people to function — one had to work the bellows while the other moved the hose over the floor! 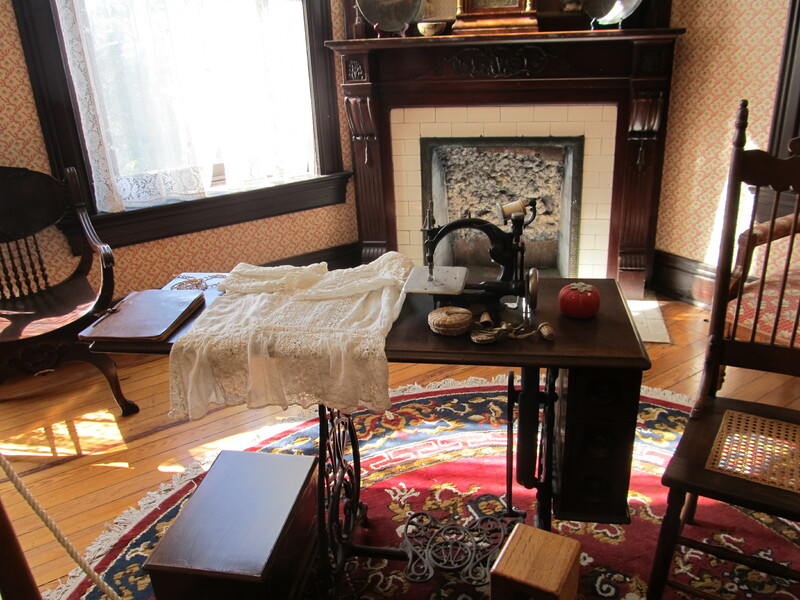 We also saw a very old sewing machine — and you know what? It still works! After the house tour, we went to a local cafe for lunch. Our waitress was able to take all nineteen of our drink and food orders, deliver them without a hitch, and provide separate checks with zero mistakes. I think she earned the huge tips that we all left her! After lunch we drove up into the hills to the Little Loom House. This is a series of three log cabins in which Lou Tate perfected her art of weaving and where she researched woven coverlet history! She was visited by Eleanor Roosevelt who fell through the floor of the cabin. 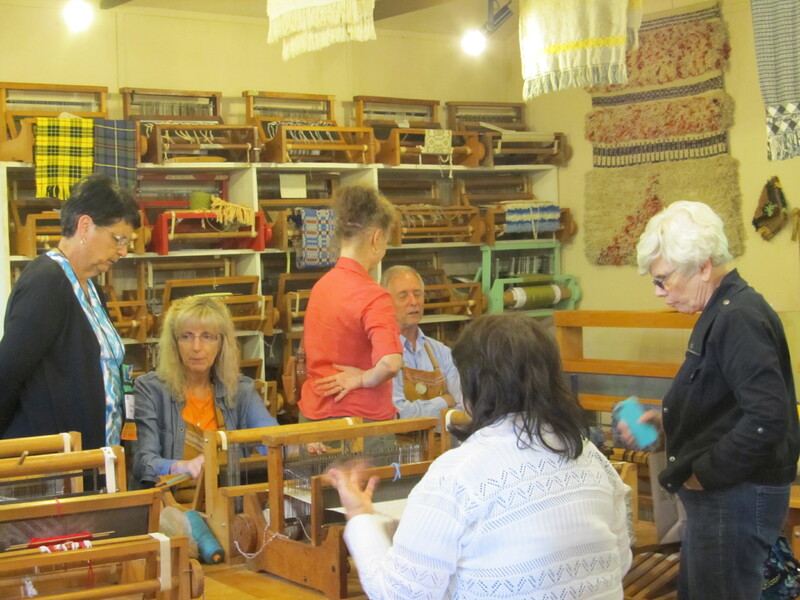 Today, many school children come for tours and are able to weave a few rows in the weaving studio. 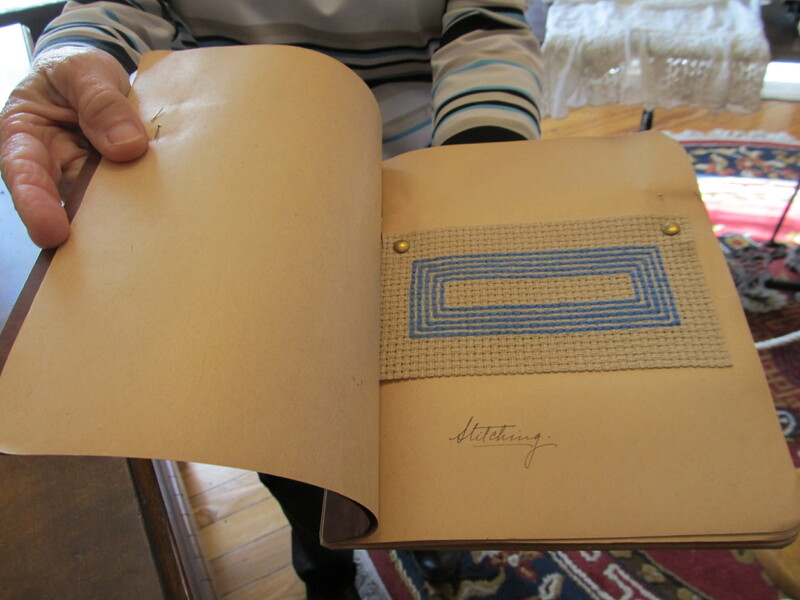 As I understand it, the small looms that are used in the studio were designed by Lou Henry Hoover! Two sisters who were neighbors to Lou Tate are credited with the original “Happy Birthday” song! It was a variation on a song that school children used to sing to their teacher each day! A fun day and a welcome break from the cardinal!